Preheat the oven to 450 degrees. Line your temp-tations 13x9 Lid-it with foil and put in the oven to heat. Carefully spread the carrots in a single layer on the hot Lid-it. 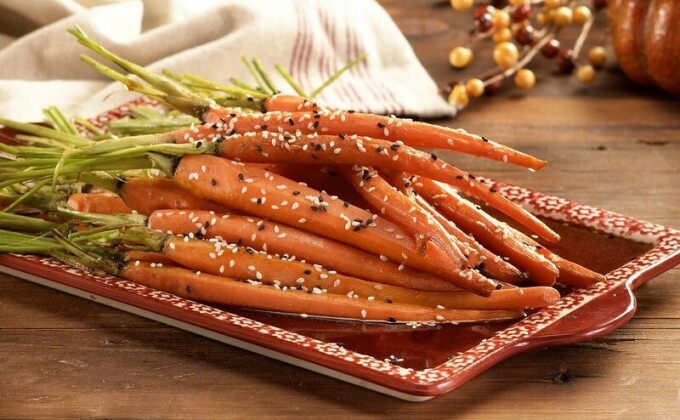 Combine the olive oil and 1 tablespoon of honey in a small bowl and pour over the carrots. Sprinkle with salt and pepper. Bake for 10 minutes or until they start to brown. Mix together the soy sauce and remaining 1 tablespoon honey in a small bowl. Drizzle the mixture over the hot carrots and toss to coat. Sprinkle with the chopped parsley and sesame seeds and serve.